Weather: humid, a little rainy, but also a little sunny! We started off extremely early, way earlier than Greg wanted, but I much prefer hiking in morning darkness than evening darkness. Despite our best efforts, we had probably only slept 4 or 5 hours, but we were feeling fresh and excited for the day’s adventure! 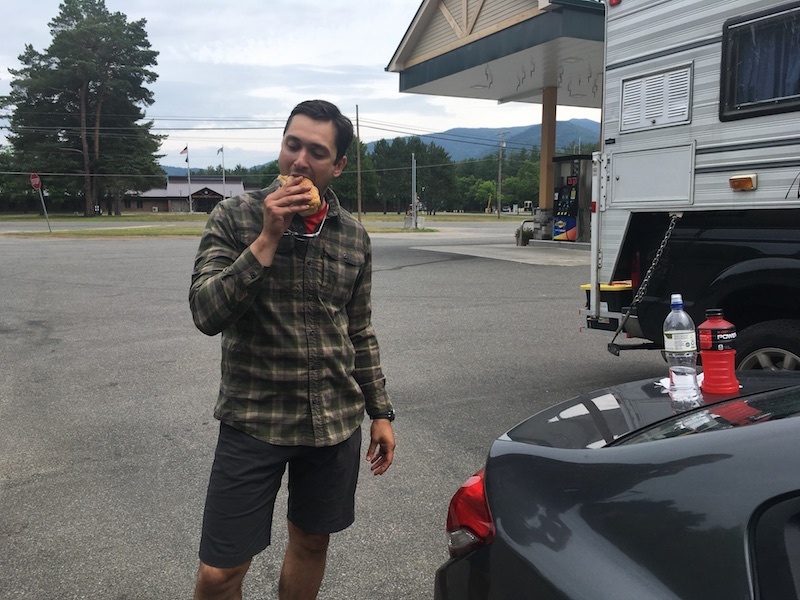 The bugs swarmed the car lights and our headlamps as we gathered up our gear, adjusted our poles, and left our lonely car in the parking lot alone. We almost missed the turnoff from the road to the start of the trail, but fortunately we spotted the disk as we were walking past and turned right in time. 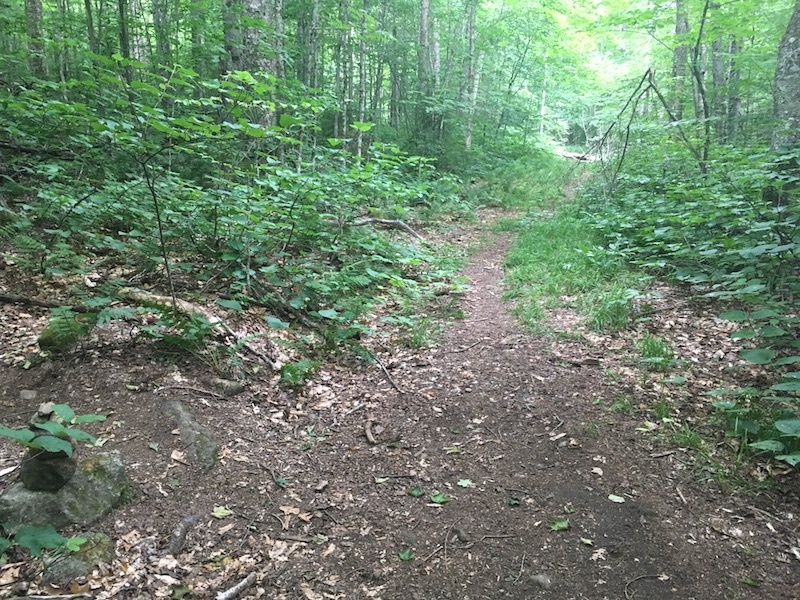 The trail started off nice and flat, maybe even a little downhill, and we walked quickly – trying to avoid tripping on any roots or crushing the millions of toads that seemed to be hanging out on the trail. Luckily for Greg, I was in front and clearing out all the spider webs for him! 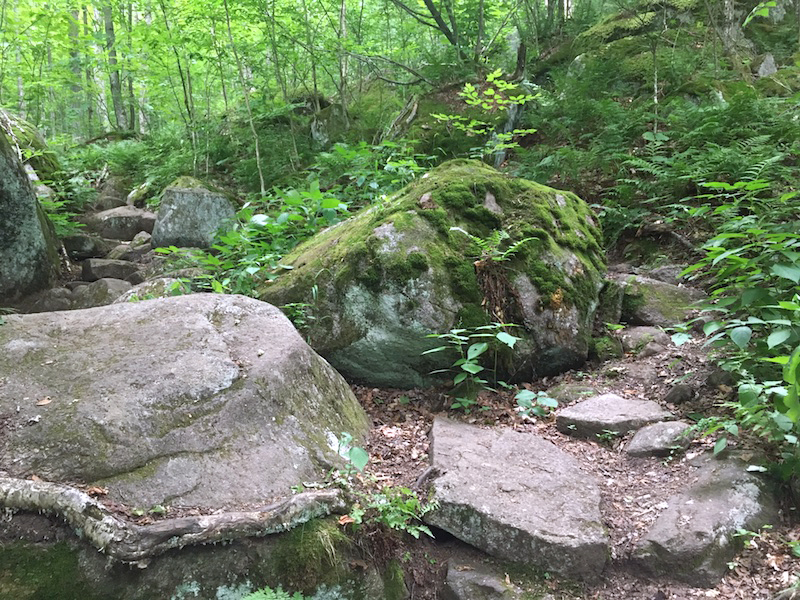 It gradually became more inclined and the trail became a little more confusing, until we were walking up a cascade of boulders. I took my time up the stair master, but it was actually really short – it doesn’t drag on like Ampersand and McKenzie. As we reached the top of this section it started drizzling and we made our way to the bald summit in the rain. I was pleased that we were ahead of schedule, but a little disappointed that we had beaten the sunrise and would be walking down in the dark. 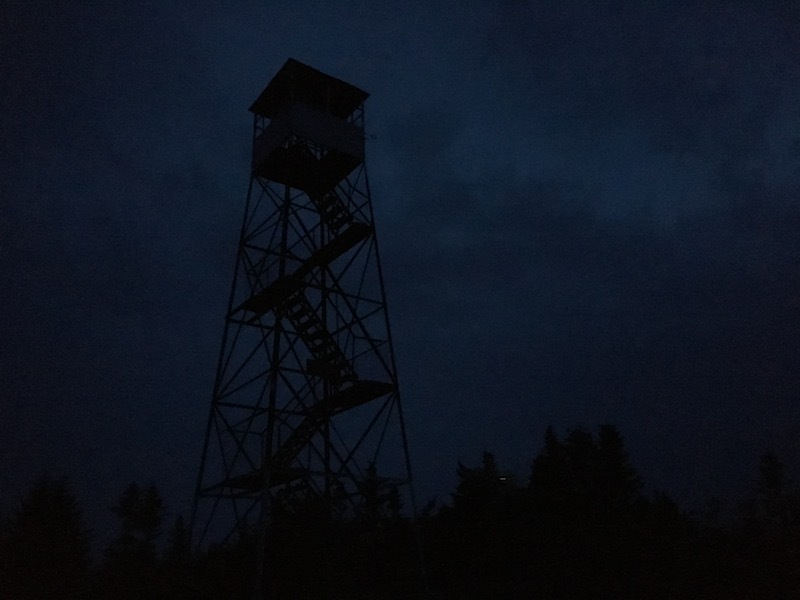 We stayed under the firetower for a minute, but since there were no views and it was raining, we headed down. Luckily the trail is sheltered once you’re off the summit, so we didn’t get too soaked. 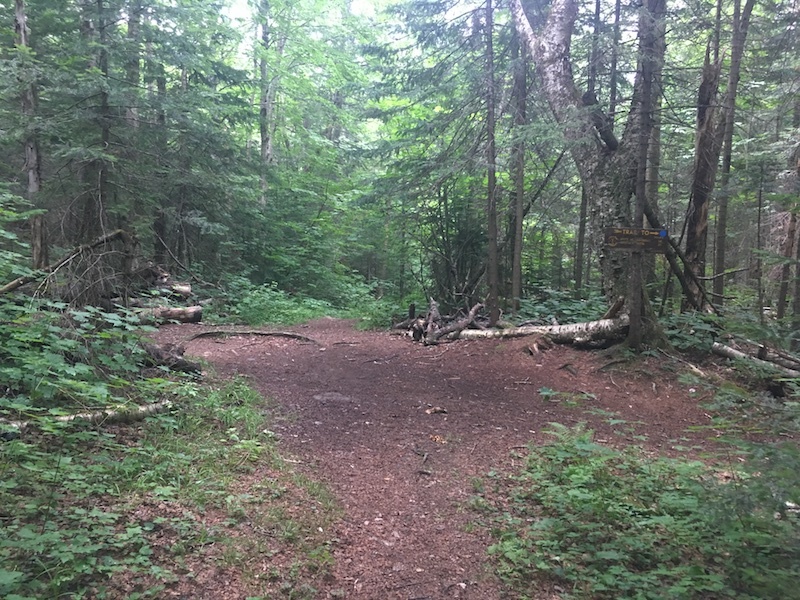 I was extremely paranoid about staying on the trail, especially going down when you can get momentum and just whiz down on any well trodden path. 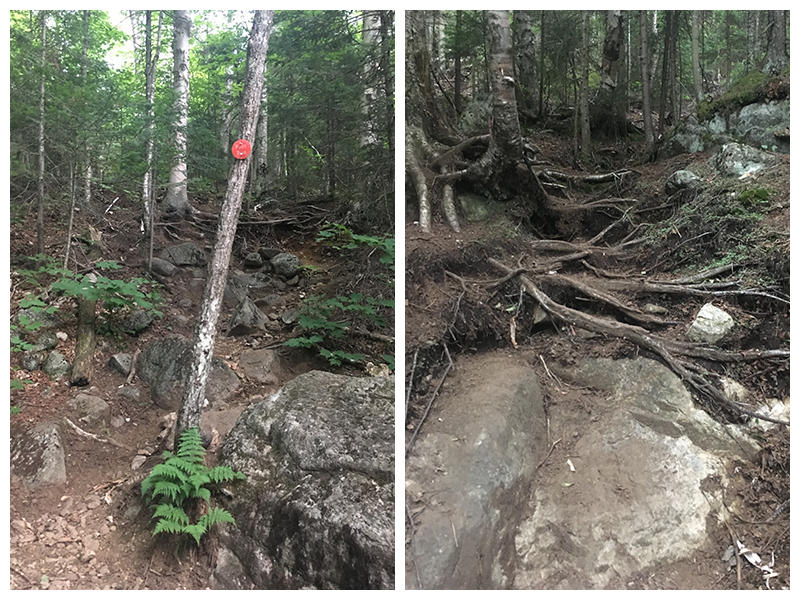 There was quite a bit of erosion, the trail was wide, and there were plenty of herdpaths; we made sure to pause and look for the few and far between trail markers whenever we were unsure. After we were back on the easy part of the trail, I turned off my headlamp. It was still pretty dark but it messes with my depth perception and is not particularly comfortable. 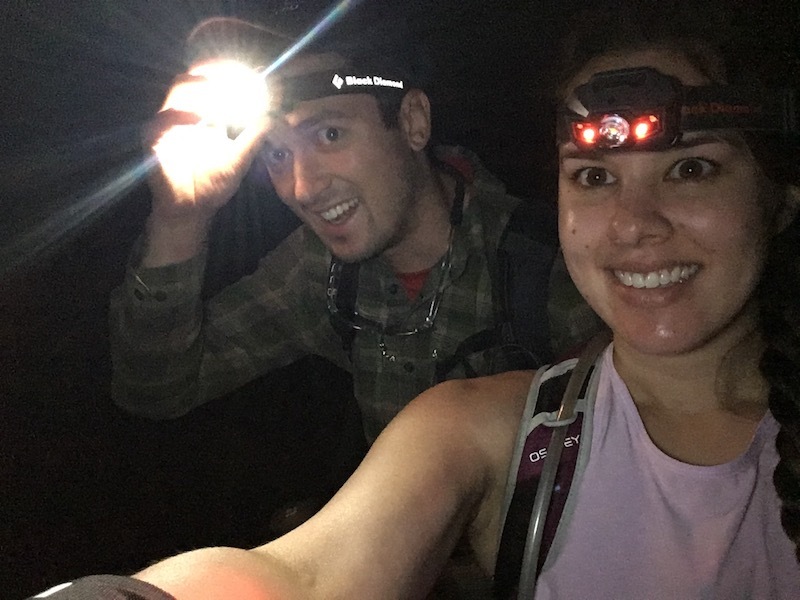 I was happy it was starting to get a lighter out because the headlamp casts weird shadows and coupled with the weird forest noises, my irrational fears had been building up. 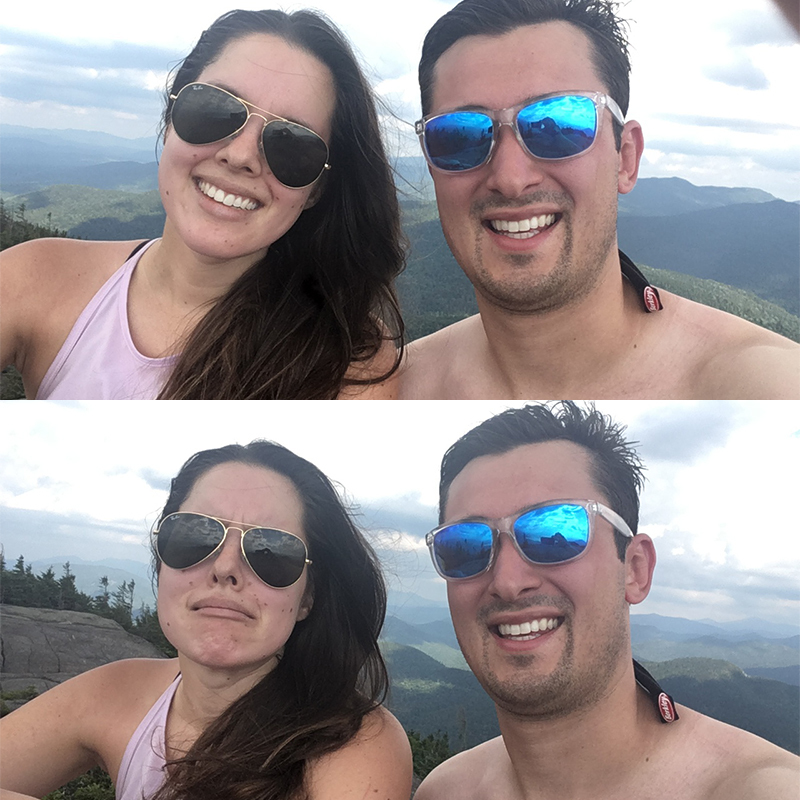 We moved quickly down, but both of us kept feeling like it was taking way too long! I guess when it’s that flat, you can’t really go much faster on the way down. Finally, as I checked my watch, feeling a little miffed that we were going to end up taking as much time to get down as we did to get up, I spotted the trail register and the road. First of all, if you are planning to do the Ultra 6er: 10000% take the Jackrabbit Trail AND take the Haystack herdpath!! 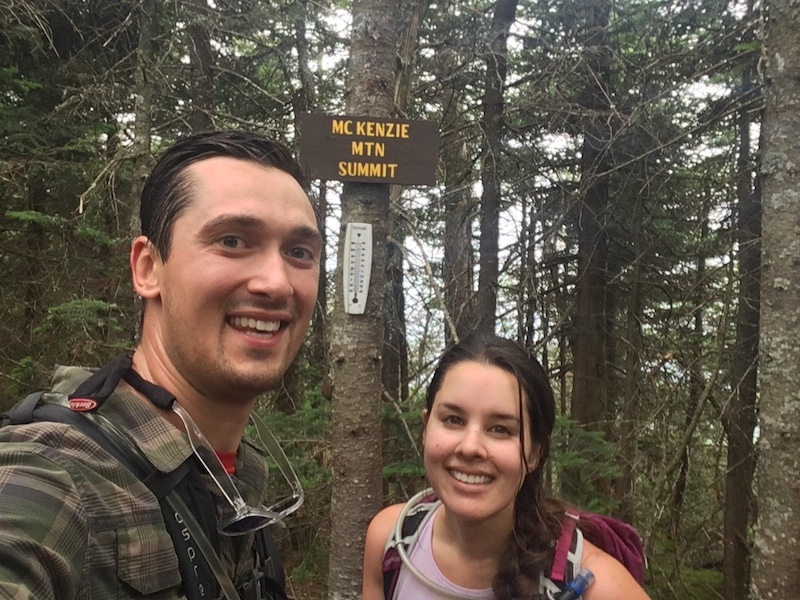 We have done McKenzie and Haystack from Route 86 and taking the official Haystack trail and it took 6.5 hours (TWO extra hours). Unless you are trying to prove something. Still don’t recommend it though. The trail starts off rocky / gravelly, but at least it’s a very easy grade and it soon becomes dirt. It took us half an hour to get to the lean to, it had a cute little table but we barely stopped to look at it as we were anxious to conquer the beast that is McKenzie. The trail descends dips slightly after the lean to, but I barely had time to wonder about making up for the elevation loss when we popped out at the McKenzie junction a few minutes later. 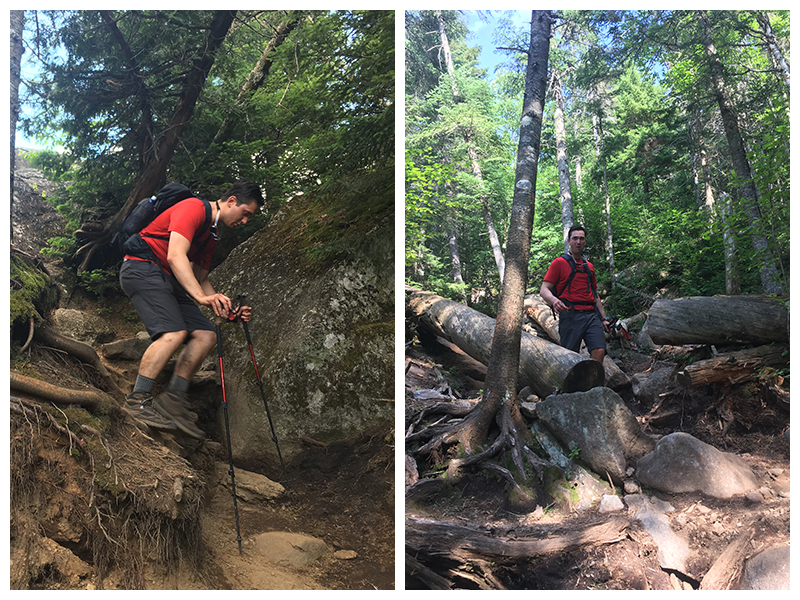 We enjoyed the first little 20 minutes where the trail isn’t too awful, just rocky and muddy, knowing that we were about to be on the hardest section of trail of the day. Having done it before though, we knew it would be a grind but very doable! Just putting one foot in front of the other. When you look up and see this, you know things are about to get fun! 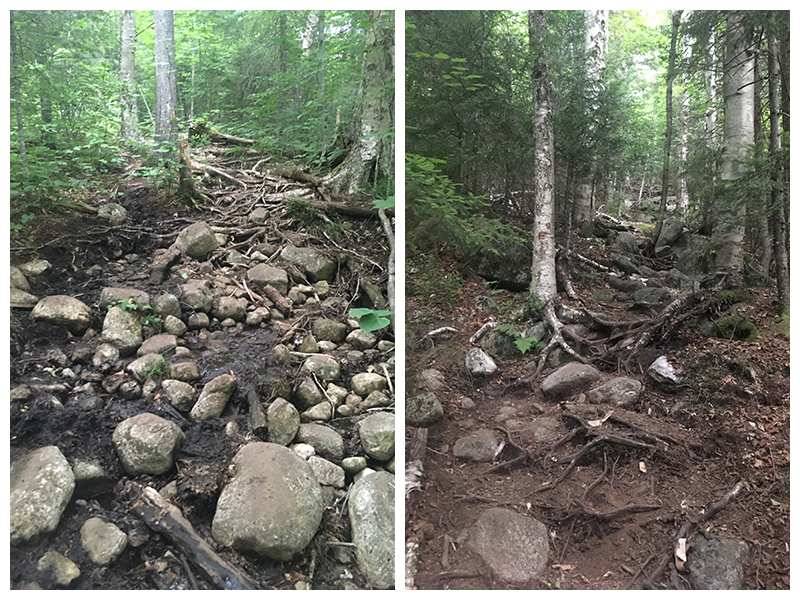 The entire trail is completely eroded and we got nice and muddy as we scrambled up rocks and tripped over roots. I’m actually shocked as I look back at pictures because in my memory it’s so long and annoying but apparently that section only took about 30 minutes. I was quite thrilled when we popped out onto McKenzie’s false summit. Just a little bit of down and then some up and we’d be there! Here is where we encountered the first people on the trails – it was a group of 4 casually running down the mountain; they seemed like they were in a rush so we just moved aside and let them pass, but we figured that anyone running down from McKenzie at 8:15 is probably doing the Ultra as well so we wondered if we might see them again (spoiler alert: we did)! 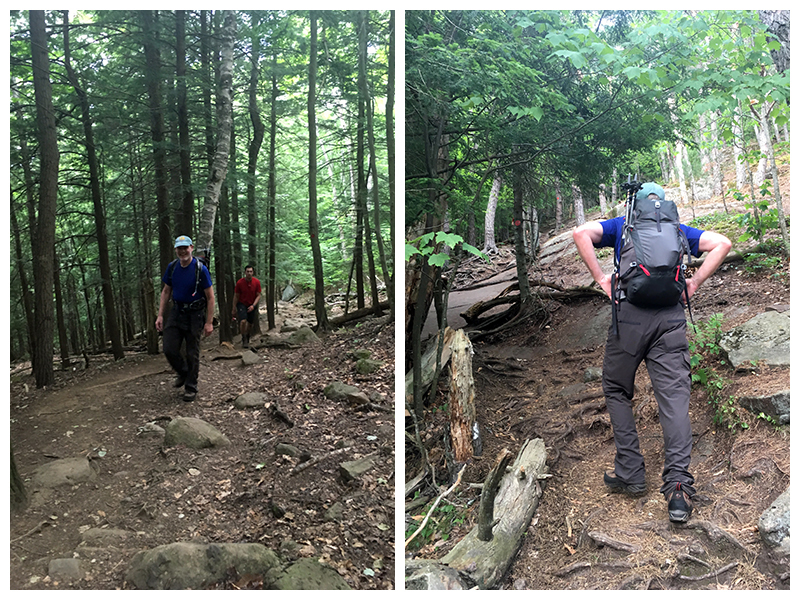 We continued along the much easier trail, up a small bump, then back down and finally up toward the real summit. Just as we were coming out on the views and the last rock scrambles, it started drizzling again. 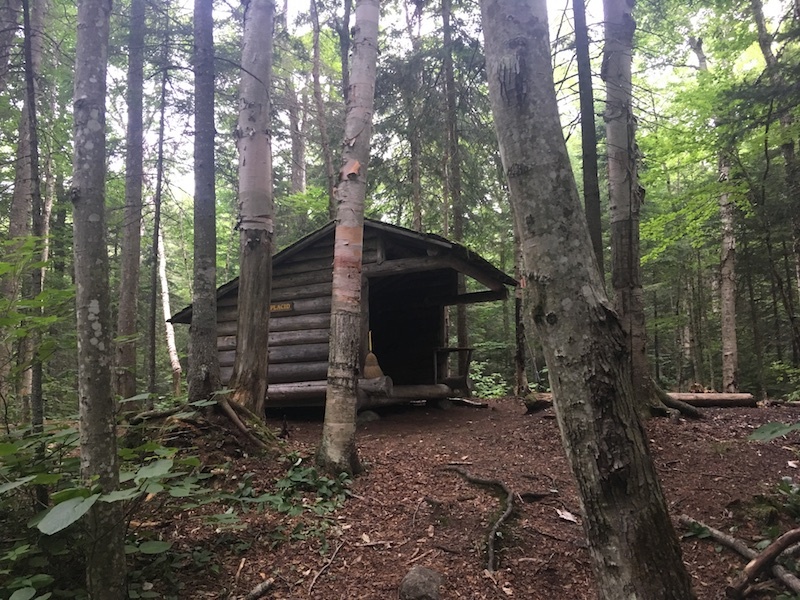 We went straight for the sign at the end of the trail, before coming back to the rock ledge to stop for some well earned breakfast – unfortunately I didn’t feel like getting rain on while I ate so we ended up sitting just off the trail with some tree shelter. We took a nice 15 minute break to enjoy our iced tea, sandwiches and Clif bars (we hadn’t been able to eat breakfast before this but now that it was a decent hour and we had climbed two mountains, we were hungry!) before turning back down. We moved pretty quickly until we reached the false summit and had to start down the eroded mess. 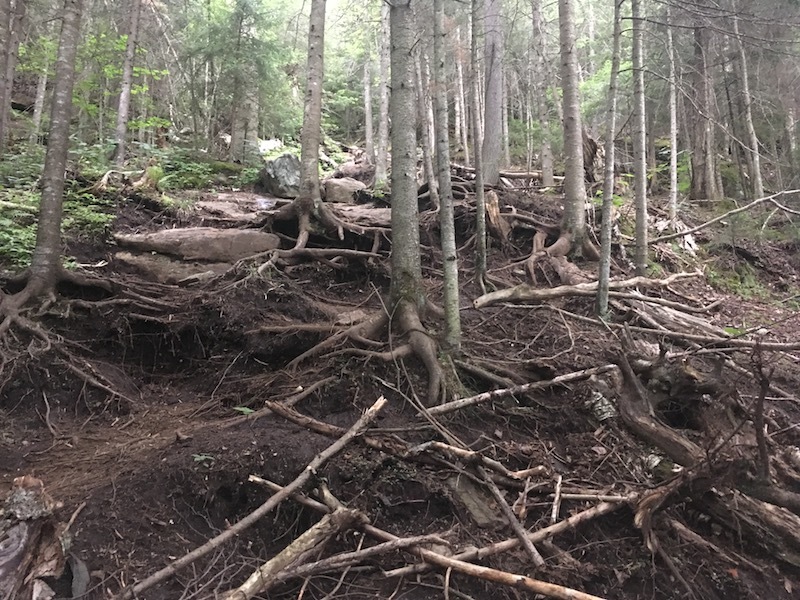 We were curious to know how quickly trail runners could move along this, because we were pretty sure we were going as slow, if not slower through this section. 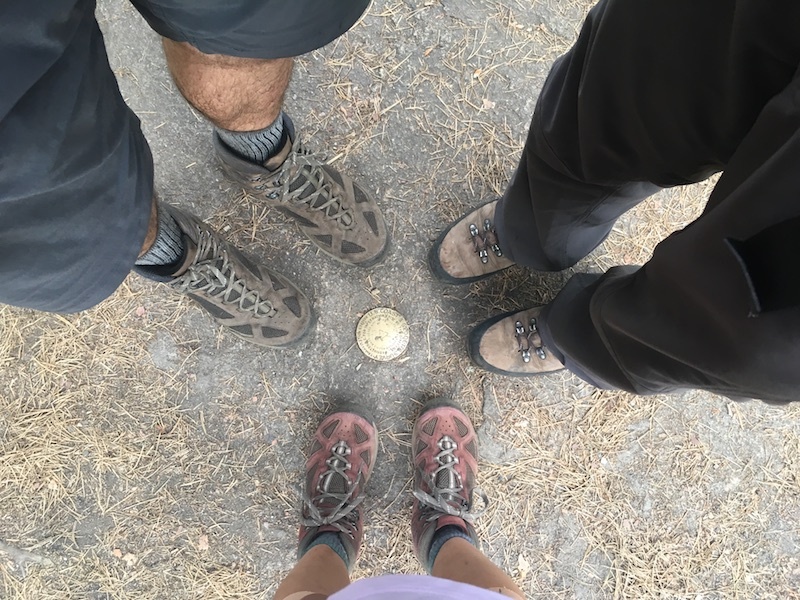 It took us an hour to get from the summit back down to the trailhead, but we were about to find out just how wonderful the Haystack herdpath is and it really lifted our spirits! 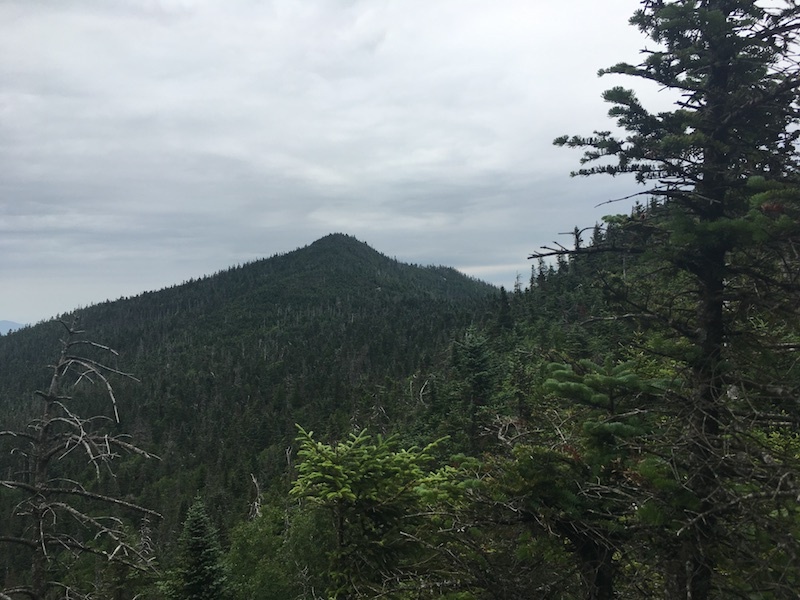 We continued along the Jackrabbit Trail toward Haystack; my eyes were darting all around because I had been told there was a cairn at a height of land and I was extremely nervous about missing it. 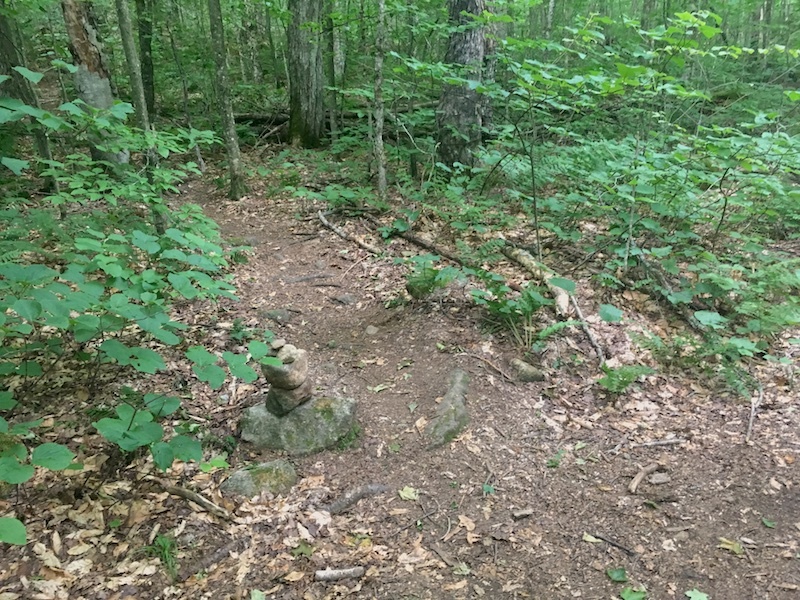 The trail was a very easy grade and a nice dirt path, and 12 minutes later we spotted the little cairn on our left (about 10 feet past the “height of land”). It is impossible to miss – after this point the Jackrabbit Trail turns into a tiny path and the well traveled Haystack herdpath branches off clearly on your left. Now that we had overcome the first hurdle, my next concerns were: how easy to follow will this be & how steep is it going to be? I CAN’T BELIEVE I WAS EVER NERVOUS ABOUT THIS / CONSIDERING NOT TAKING IT. 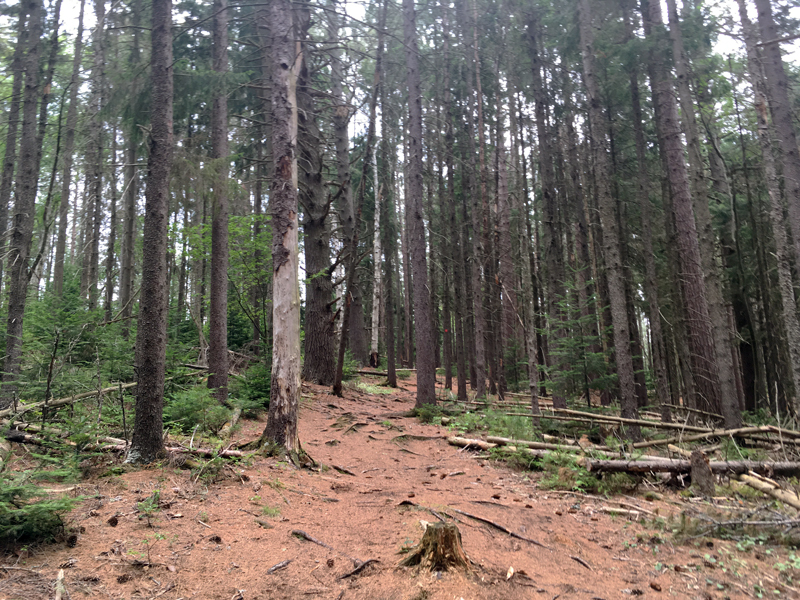 The path is beautifully carved out through the forest, and honestly even easier to follow than eroded trails on St Regis or McKenzie! And it is such a gentle terrain and incline, even compared to the official trail. 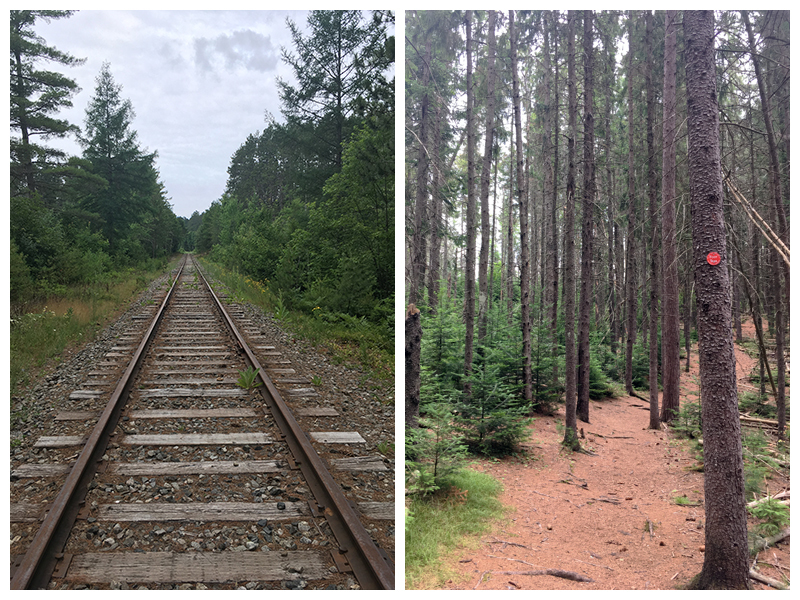 I was in shock and couldn’t stop raving about how easy the path was to follow and how I was crazy to even consider doing the whole backtracking along the trail from the 86. I was even more shocked and thrilled when we came out onto the ledge after less than 15 minutes on the herdpath (for reference: in a previous hike it took us 1:12 to get from the JR/McK junction the Haystack summit when we backtracked along the 86 trail and took the official trail up). yes, that is dried mosquito blood on my face. We spent a few minutes hanging out at the summit before heading down. It felt like we were flying down the herdpath and back onto the JR Trail and we were back at the junction in 17 minutes. From there it was more of a grind; our feet were pounding as we walked out the last couple miles. 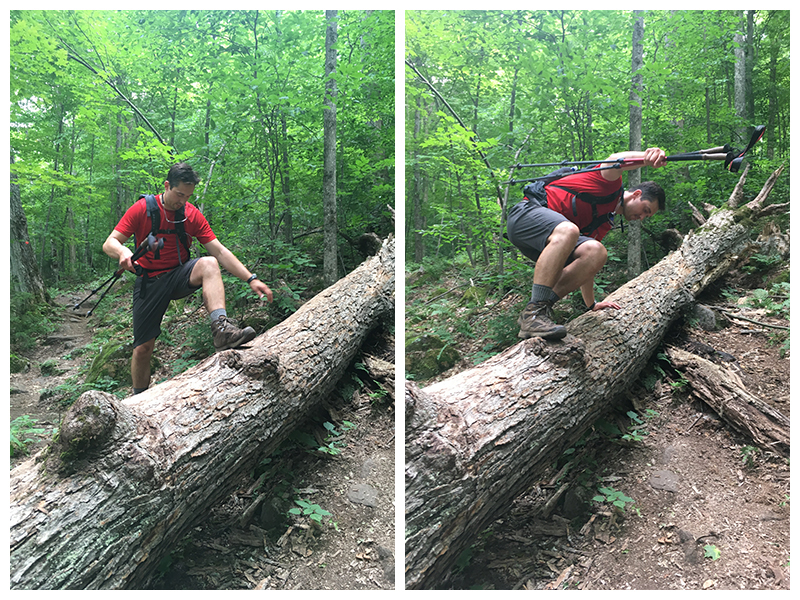 If anyone has knee problems like I do – bring your poles and use them on every mountain start to finish. Since it was now late morning, we started running into quite a few people! Good thing we had arrived early and didn’t have to worry about parking. It felt really good to sign out of this register, 3 mountains down, ahead of schedule! We decided we had earned ourselves a lunch break / pit stop. So I had never done Scarface (or Baker) and Greg had warned me that Scarface sucked so I was really prepared for the worst…and pleasantly surprised! 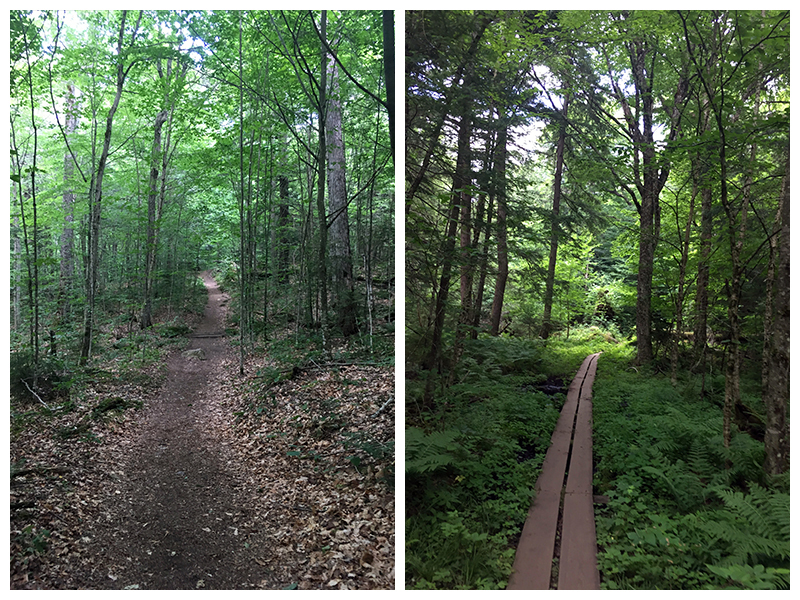 It was a beautiful trail through an enchanted forest. 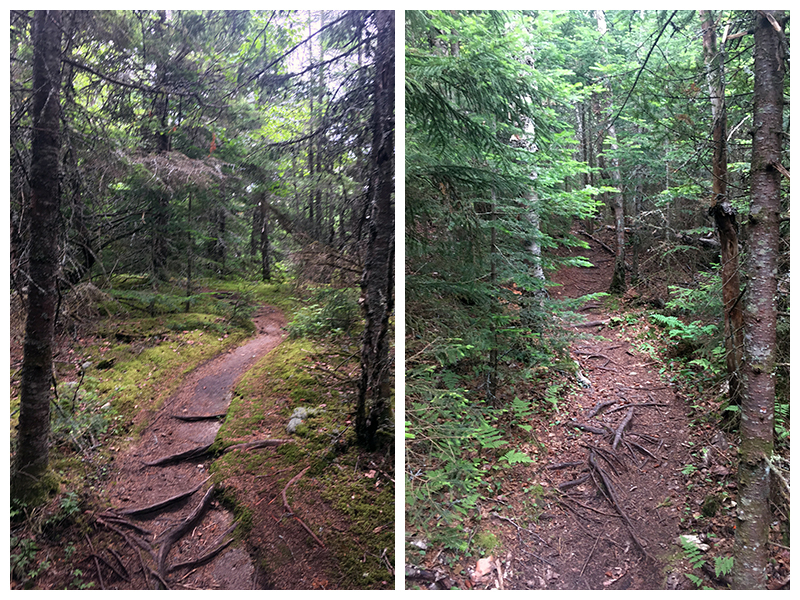 The trail was soft dirt with pine needles and the sun was shining through the lush forest. 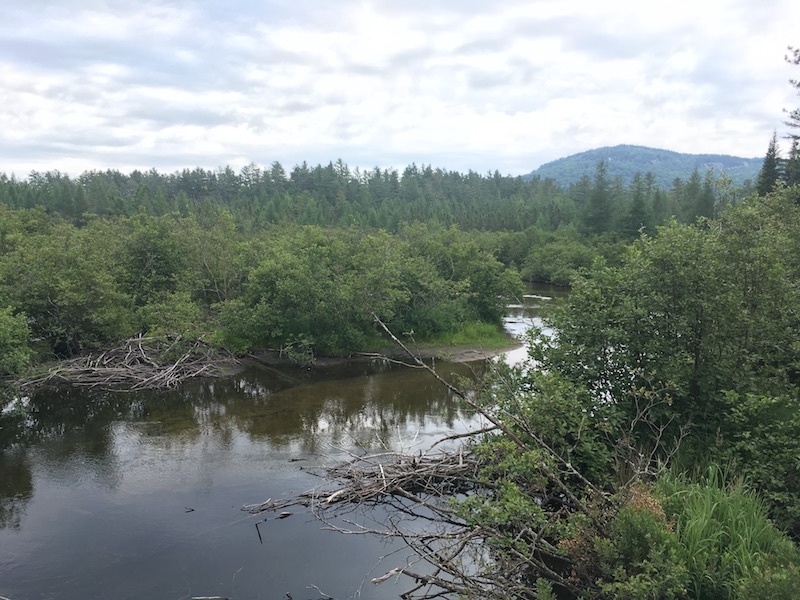 We crossed over railroad tracks, passed the memorial bench and crossed over the boardwalk, stopping for a moment to enjoy the views over the water, before continuing on. 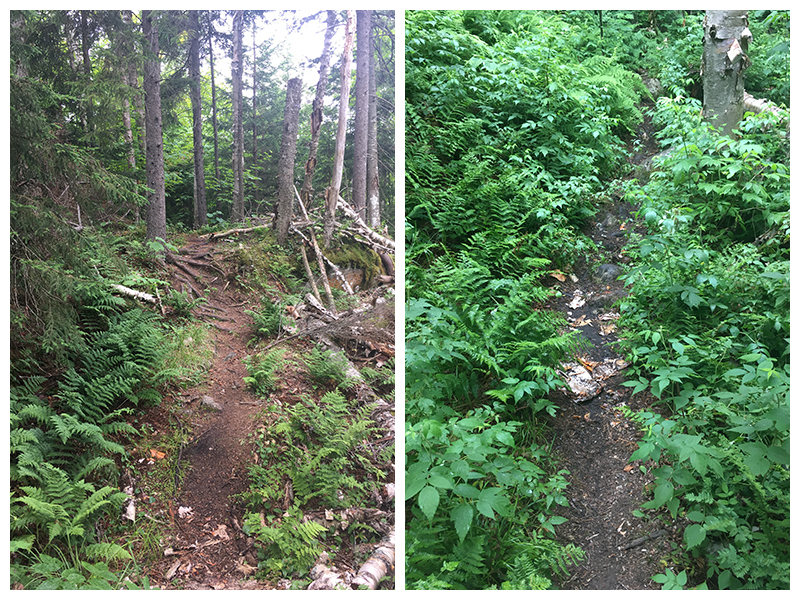 Just after some ancient rusted equipment, the trail takes a 90 degree left turn and after that we start to climb gently. 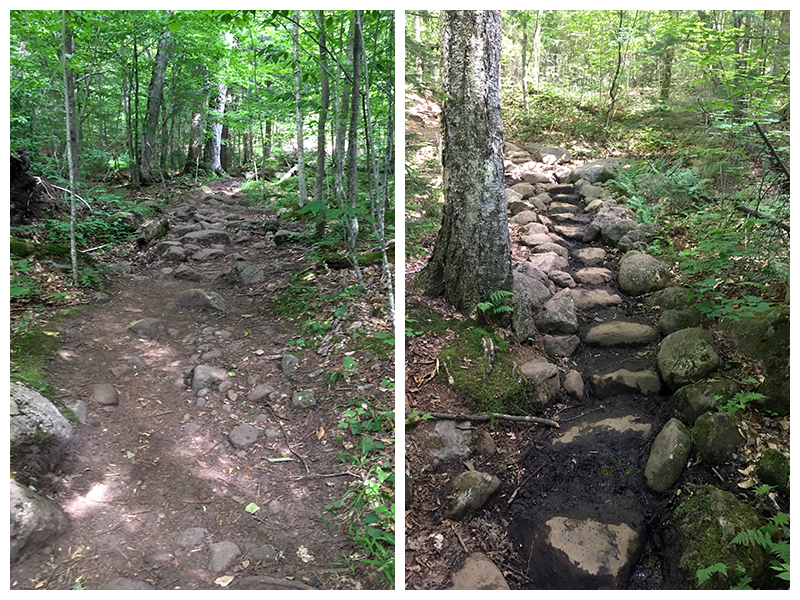 The started following a stream up, and the trail got gradually steeper and steeper. It was still pleasant walking though, no big steps or obstacles. We heard voices and then the 4 runners from McKenzie appeared; they seemed less rushed so we chatted with them briefly – this had been their #3 and they were now headed out to St Regis. We wished them luck and told them we’d see them on Ampersand and/or Baker! A few minutes later we reached the ledge, which had a nice window of views, but we hardly even paused. The last half mile really dragged on, it was basically flat but I was also excited to meet up with my parents so it probably seemed longer. 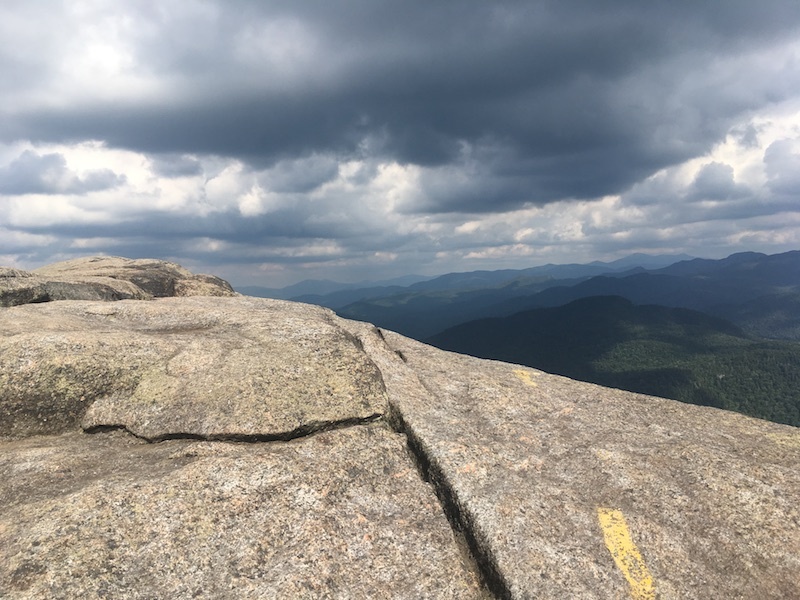 Then I heard my dad’s voice: “I wonder where they are” and I quickly answered “we’re here!” as we rounded a turn and saw them standing on the summit. We sat down and hung out with them for 15 minutes. It helped revive us a little to chat with people other than ourselves! We had already been awake for 11 hours!! They wanted to take their time on the descent so they said goodbye, and we told them we’d see them in a few hours! The descent was the easiest of the 6 (in my opinion). The pounding wasn’t as heavy and it was that perfect incline where you can move quickly and controlled. On the way up, the pine needle section hadn’t felt like we were going up that much, but it made for a really nice walk hike down. We signed out at the register and I left our finish time with a ❤ xo for my parents…it did occur to me later that other hikers might find that extremely weird but whatever!! We were 4/6 and I knew the last two were very manageable! If you are doing the Ultra during the summer / high season – definitely leave it until earlier or later in the day. We were lucky to get a spot in the parking lot because groups had already started leaving by this time – since the trailhead is a little isolated it would be really unfortunate if you couldn’t get parking and it messed up your plans. 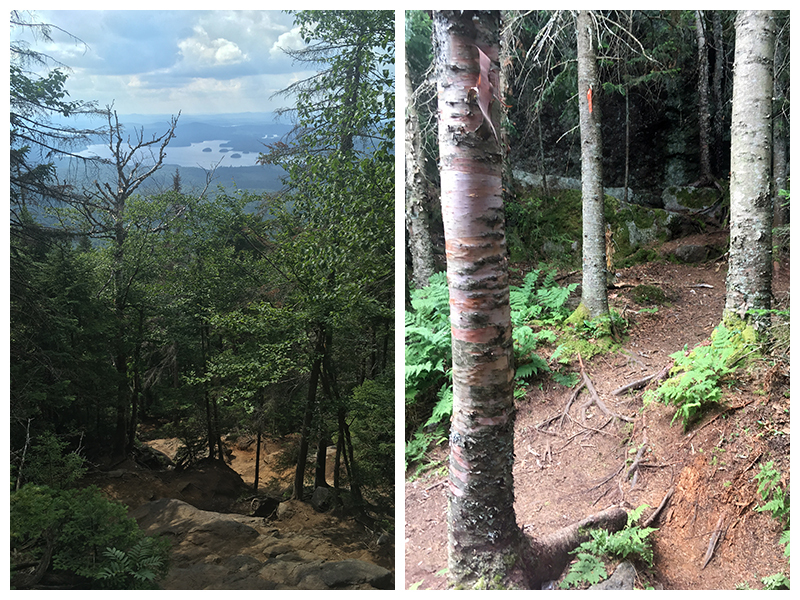 What I like about all these Saranac 6er mountains is that they all start off gentle and then start climbing. We moved quickly enough along the gentle dirt trail and passed many many groups of people, all going the opposite direction. It felt like we were going soooo slowly. We only took a couple 30 second breaks, but it felt long, the bottom of my feet were hurting and my wrists were aching from putting weight on the pole straps. 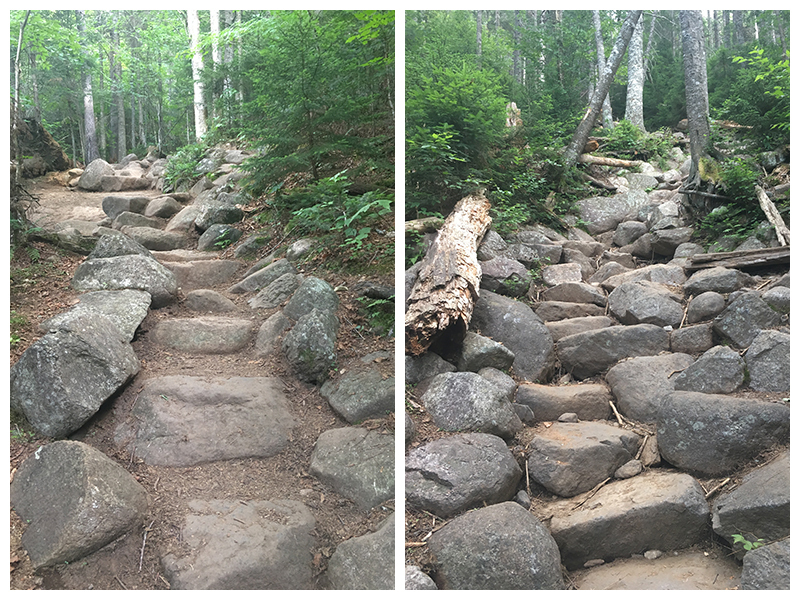 In some places, we couldn’t help but cheat and follow where many other people had around the giant boulder steps. 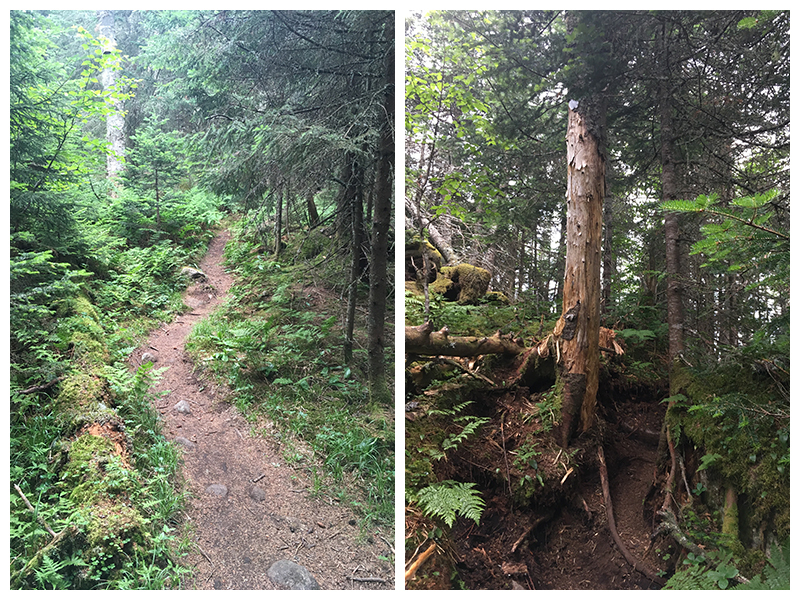 We reached the last little steep part, where the trail splits, we always go straight up to the right – and then regret it slightly when we have to duck under a fallen tree…but then the trail finally flattens out! Just below the summit, there is a reroute marked by some ribbon, not sure what the story is there but it feels a little more direct and I didn’t complain! We scrambled up the rock face up onto the bald summit and were amazed to see that we were the only ones there! We made our way to the benchmark on the summit and collapsed down for a nice break. We relaxed for 12 minutes, enjoying the views and basking in the sun. We knew we weren’t done yet, but the goal was feeling very attainable at this point! And even better, I was feeling pretty confident that we could either catch a mountaintop sunset on Baker or walk down in sunlight. Either one seemed wonderful to me, although when Greg pointed out later that Baker’s lookout didn’t face the sunset I was pretty happy to not feel pressure to stick around for it and just walk down and go get my milkshake ASAP. As expected, the pounding down was even harder than the pounding up, but there was a spring in our step! 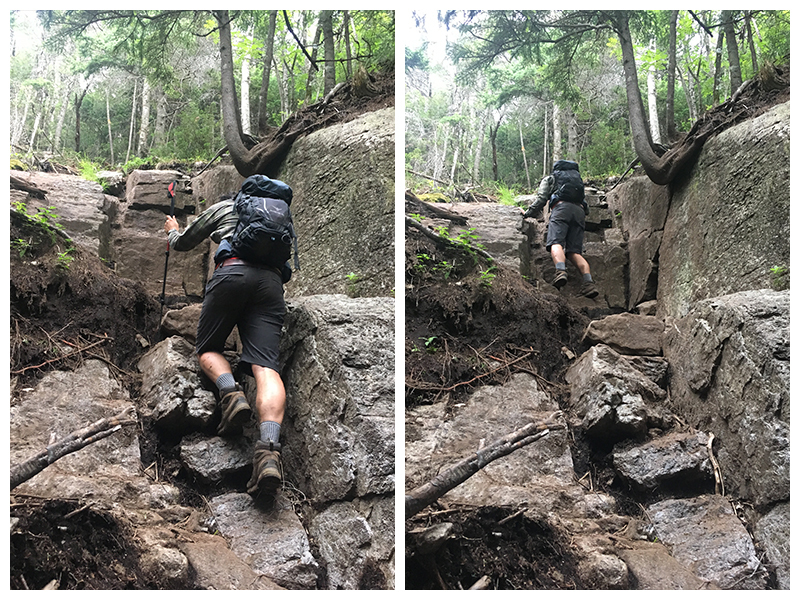 I carefully lowered myself down the big boulders, putting a huge strain on my pole straps and it wasn’t long before we were back on the easy trail. I was worried it would feel like St Regis and go on forever, but it actually went by really quickly! We only took breaks to drink iced tea from the Nalgene, I still managed to spill on myself, but at that point I was so dirty it didn’t make a difference. We had a nice surprise driving up to the trailhead when we spotted my dad’s car parked on the side of the road! 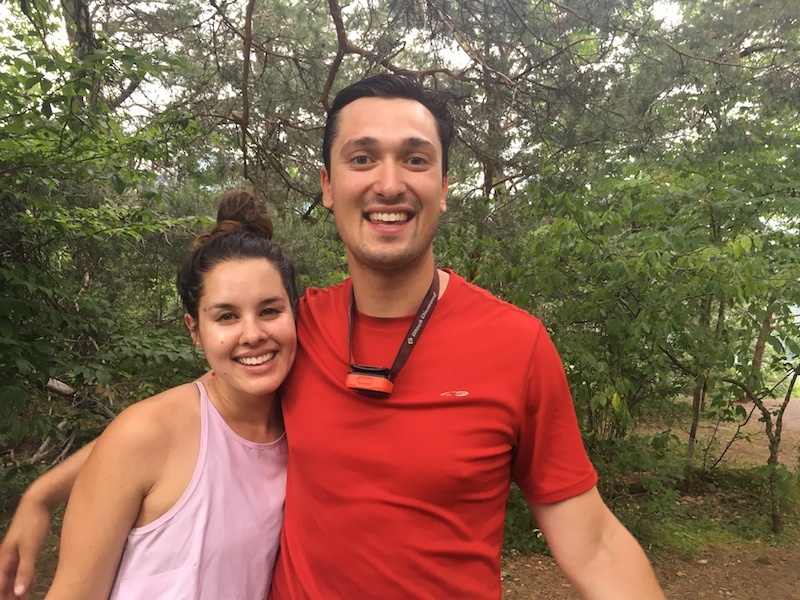 We had been texting him from each summit to let him know our progress and we had invited him along but I hadn’t been leaving my phone off airplane mode long enough to receive texts so I didn’t know he had decided to join us! Greg had said that Baker was “a cake walk” and that had helped keep my motivation up, but it is no joke. Although, once I thought about the elevation for a second (0.9 miles + 900 feet) it kind of made sense. My dad still had a full pack, but Greg and I had dropped ours and I was only carrying my phone, a coconut water, and my headlamp around my neck. 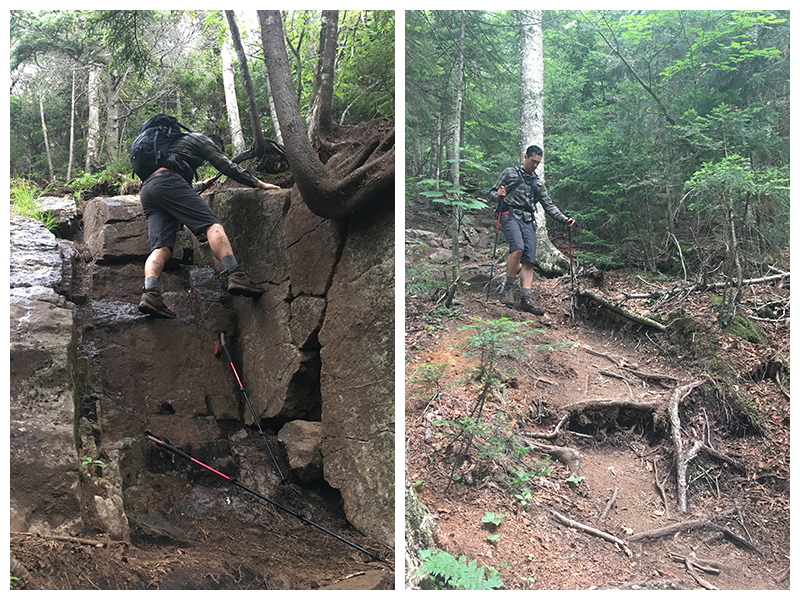 The trail was steep up and on rock faces but we had a last burst of excited energy! 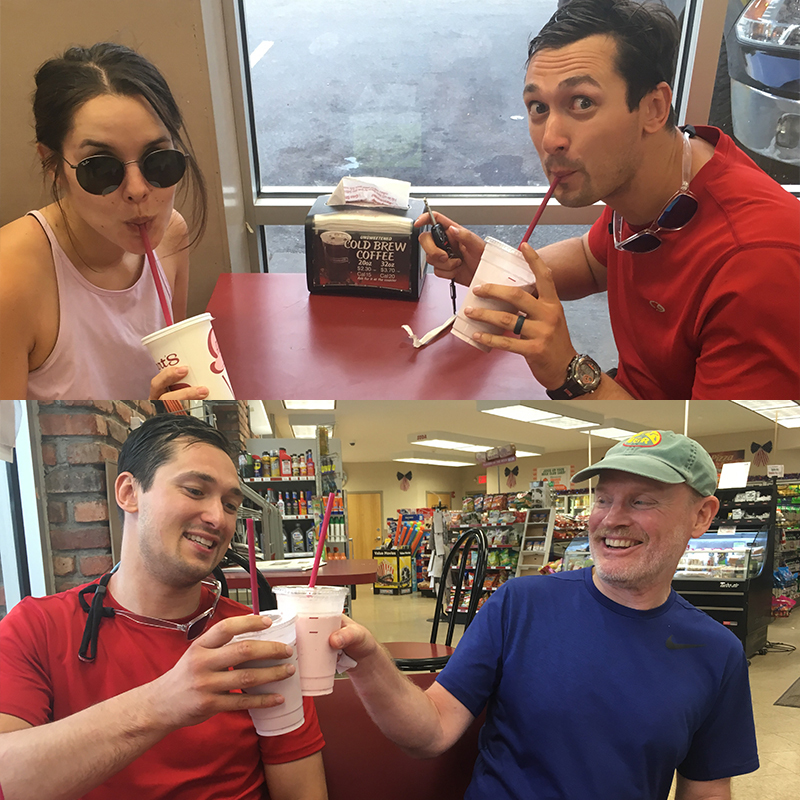 We were stiff but we couldn’t wait to reach the summit (and get back down, and ring the bell, and get a milkshake). We came out to the view, a few people were sitting there, we quickly said high and then rushed on to reach the highest point. We hung out for 10 minutes, chatting with the other group on the summit, taking some photos (of course) and having a mini celebration but we were anxious to get down! We walked as slowly and carefully as we could; we hadn’t brought our poles either, which might have been silly – but I didn’t even bother taking my dad up on his offer to use his (the idea of pulling them out, setting them to the right length, etc seemed like it would take longer than the descent itself). 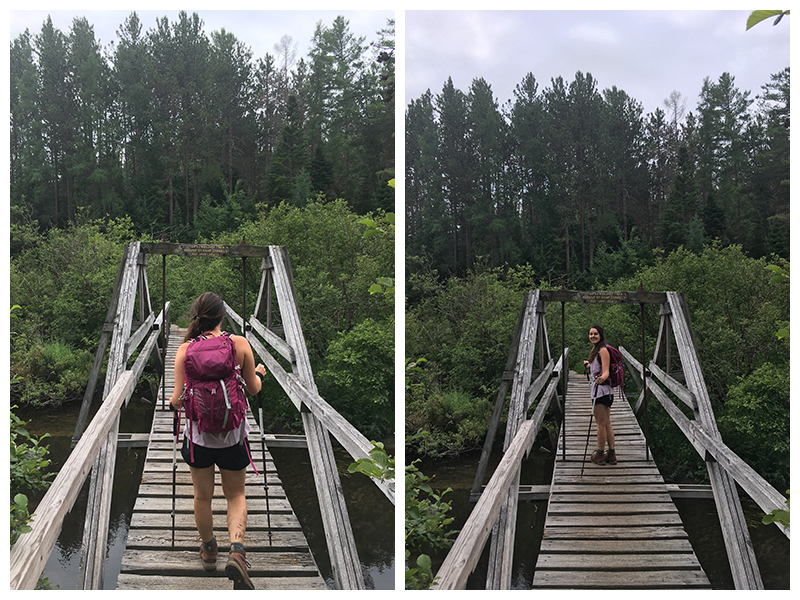 As we walked through the tall grass right before the trailhead, our feet were throbbing and the bugs were attacking in full force…but excitement was high! 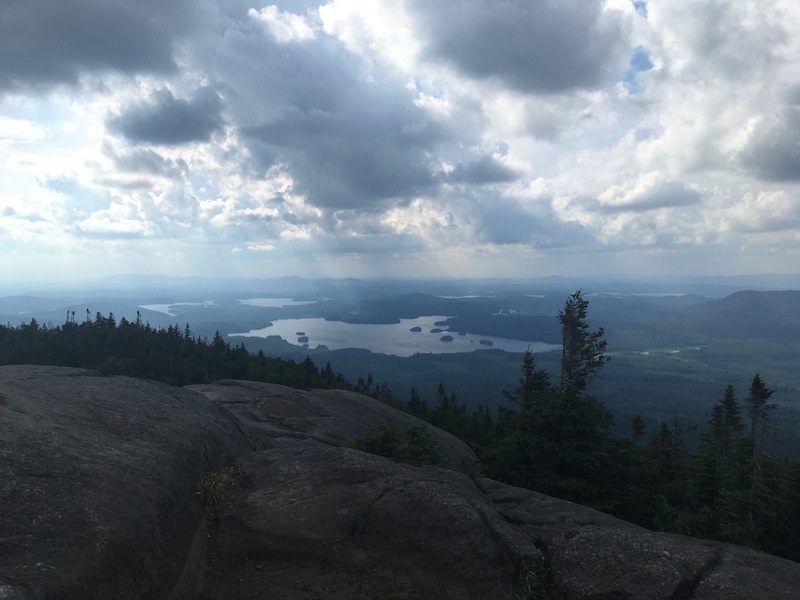 This entry was posted in Saranac Lake and tagged Adirondacks, Adirondacks Photography, Ampersand, Baker Mountain, Berkeley Green, Haystack, Hiking in New York, Hiking in the Adirondacks, McKenzie, New York, Saranac Lake, Saranac Lake 6er, Saranac Lake Ultra, Scarface, St Regis. Bookmark the permalink. 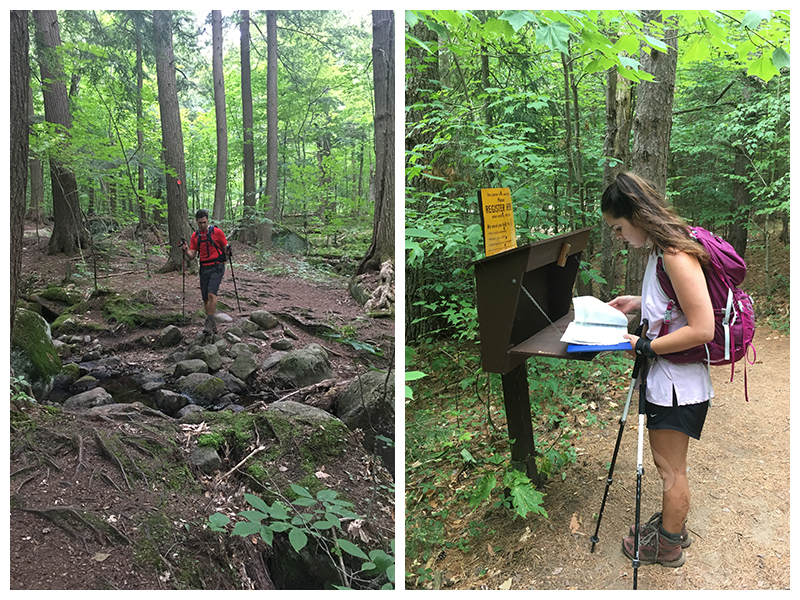 I have never heard of the saranac 6er challenge before, though I had heard of some of the mountains by way of passing the trailheads and studying the maps. 30+ miles and over 8000 feet of elevation gain is mighty impressive though! Congratulations! Thank you! 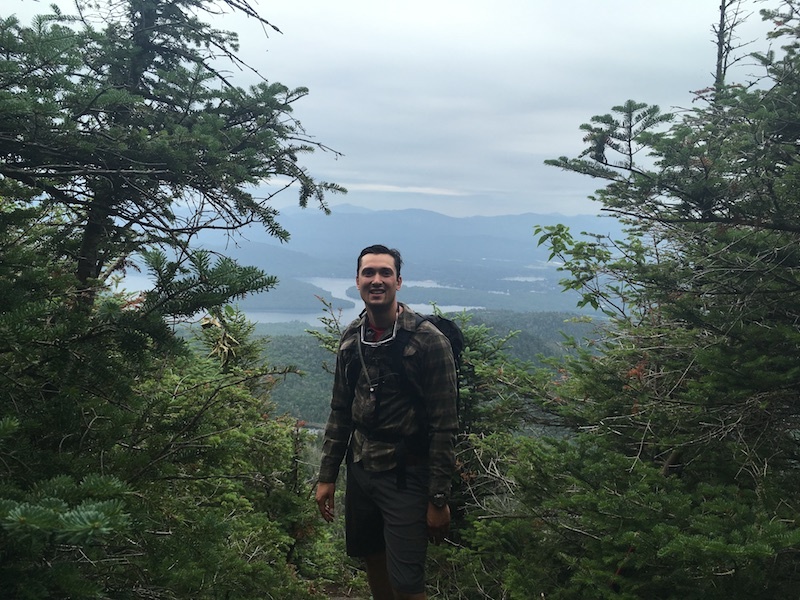 They are beautiful hikes and well worth it if you’re looking for non high peaks in the area. 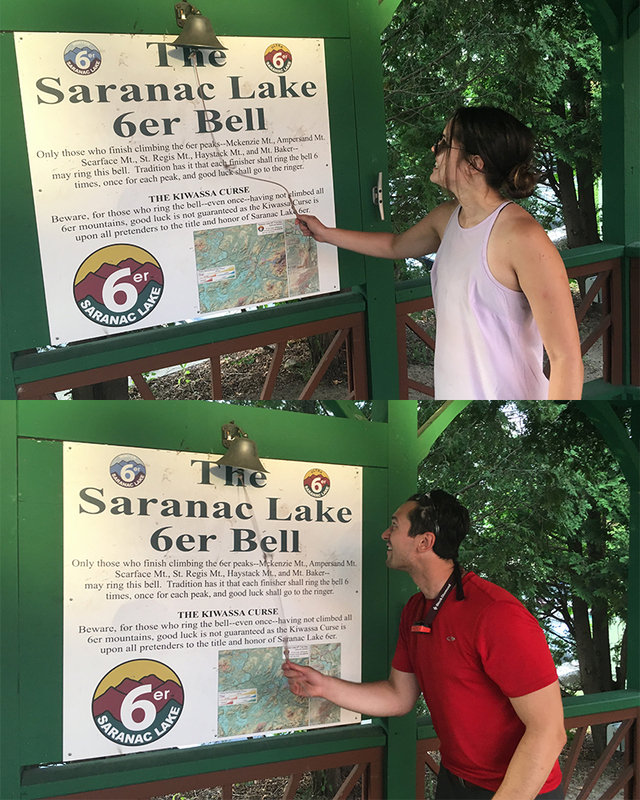 And no need to do them all in one day to get the official Saranac 6er status, you can take your time 😉 Happy hiking! Nice to see you post again. I’m on the way to becoming a 46er (a “6er” so far, only 40 more to go). 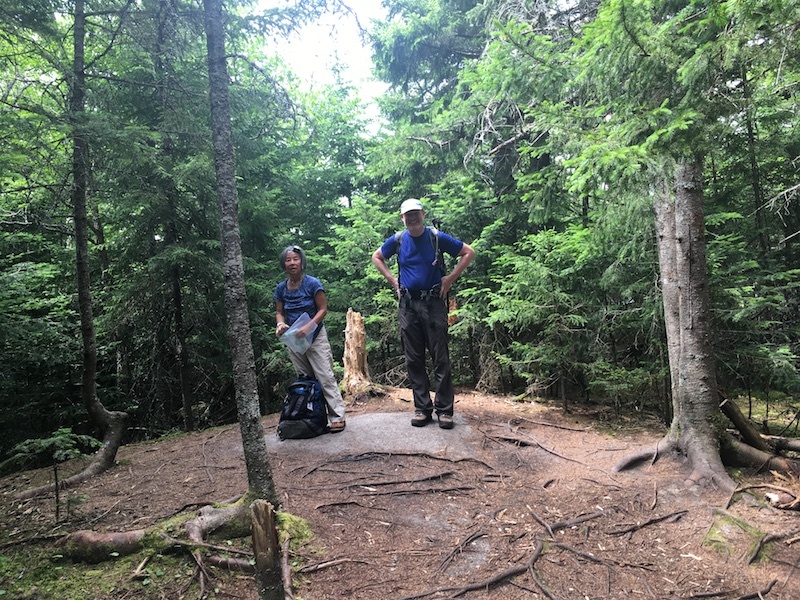 I was on Big Slide last week with the boys from my Sunday School class and while on the summit, I spoke with a couple from Ottawa who said that there are hikes in the Laurentians that are great. I assume that you’ve hiked there and if so, please post photos. I’d love to see them. Congrats on #6 – it’s such a wonderful experience, there’s no rush!! 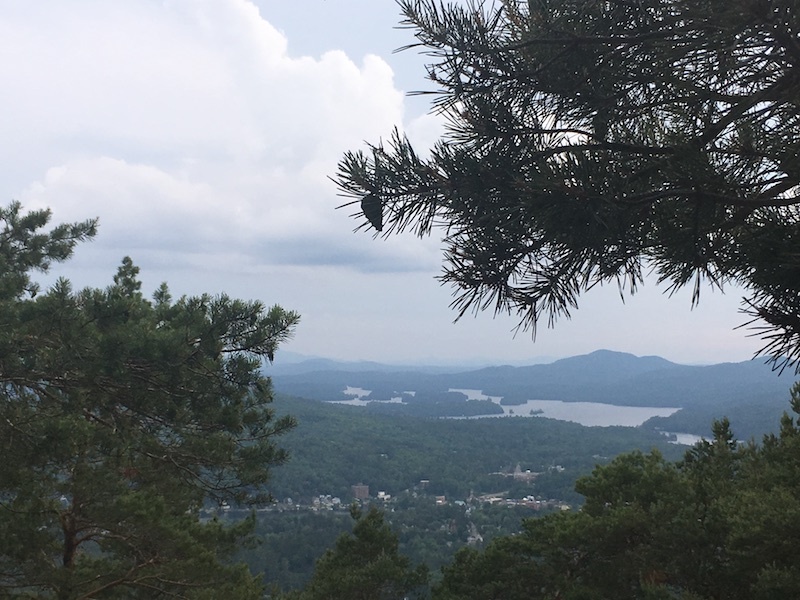 I have done a couple hikes in the Mont Tremblant area and it is lovely; unfortunately I haven’t really been back the last few years and now I live south of the Adirondacks so I’ve been spending more time discovering the Lake George region than the Laurentians. Fantastic write-up and congrats! Following this site, myself, my wife, and then college age daughter completed the 46 last September after about 25 months. Ended on Skylight after a moonlight hike up Marcy to catch the sunrise. 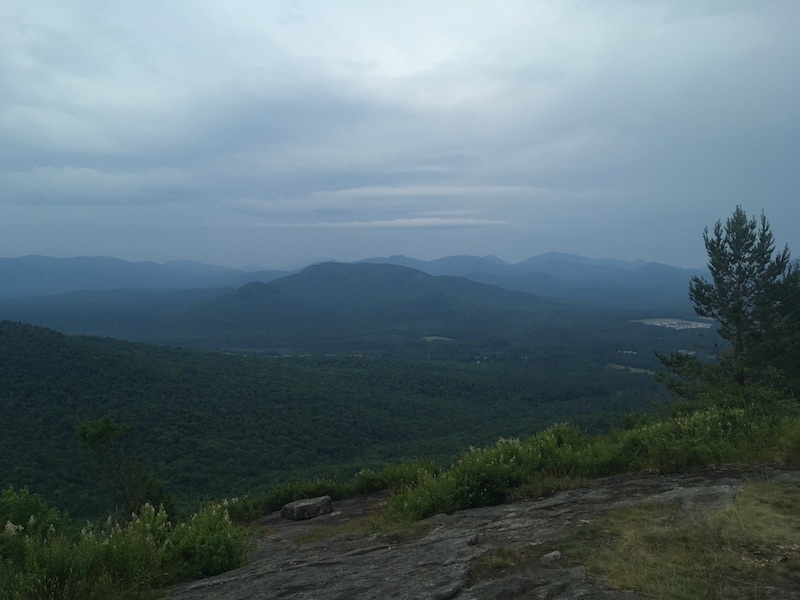 Perfect timing of this S6 post as hiking McKenzie this weekend from the Whiteface Inn area (Jackrabbit). Never would have thought to get Haystack also from the reverse, thanks so much for this tip and actually all the ideas and sharing of pain points and successes here over the last few years. 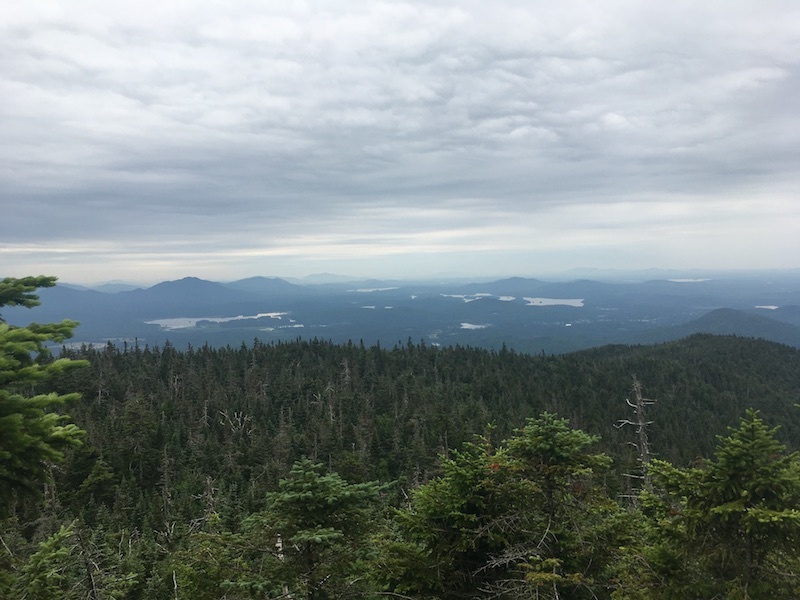 So much out there, wrapping up the S6 and Adk/Cats FireTower challenge this fall. What’s next – LG12, LP9. NH48, NE 67, Northeast 111/115? Thank you! And congratulations to you three, that sounds like a spectacular way to finish!! 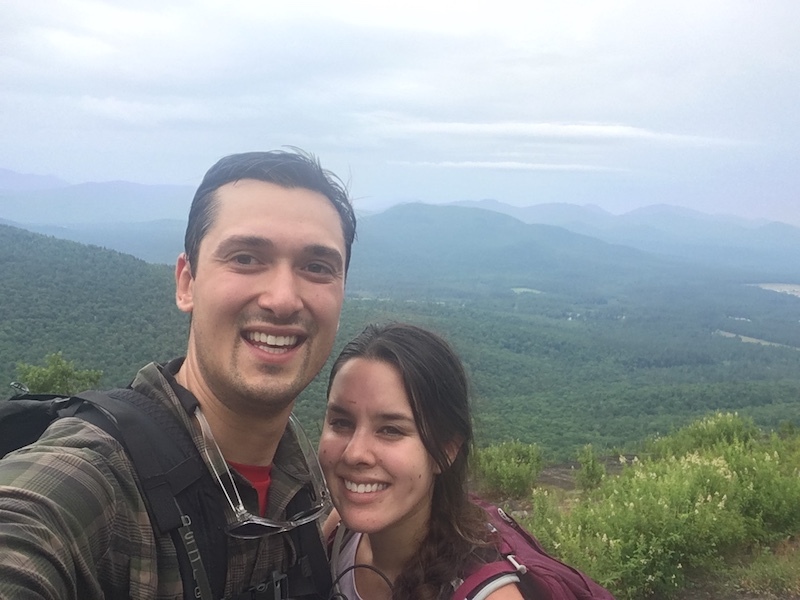 How was your McKenzie hike, did you do Haystack as well? 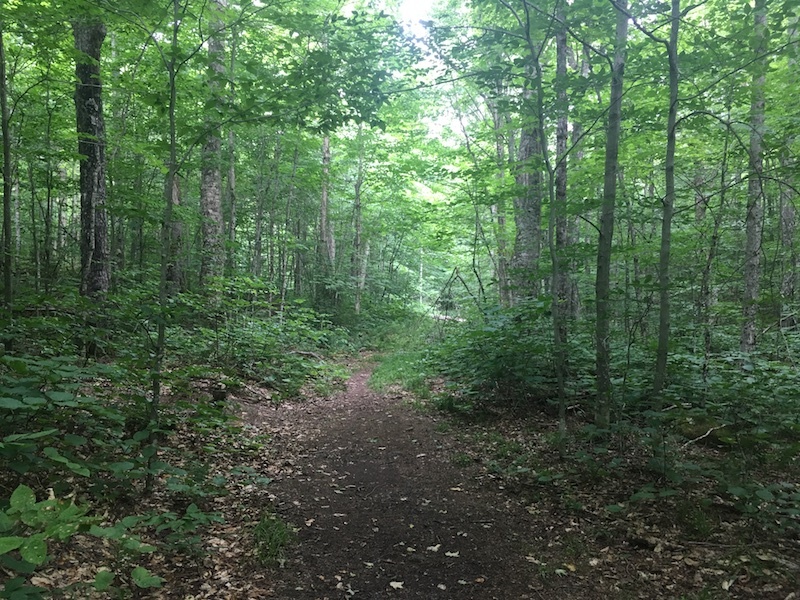 My husband told me I had to post about the SL6 just to mention the herd path because there aren’t many photos of it and the world needs to know…I’m always happy to know that I’ve helped at least one person out there! 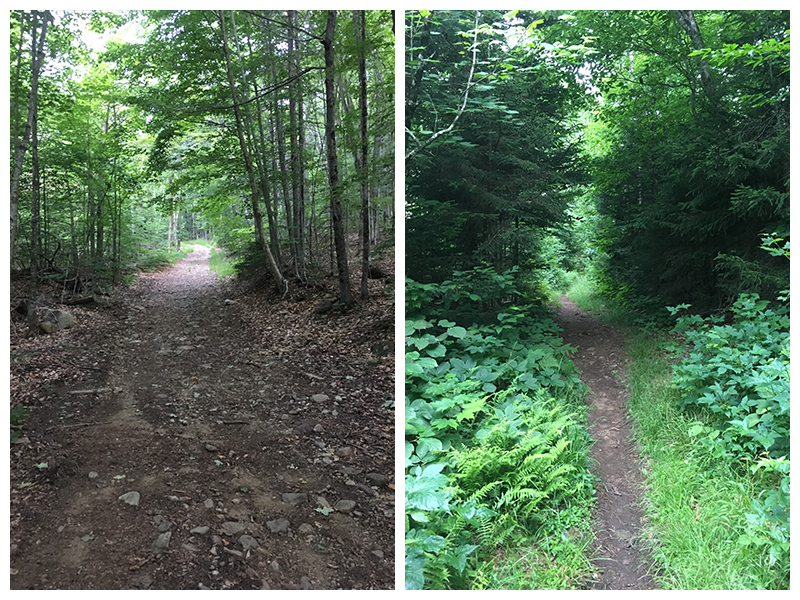 I think I’ve knocked off a few of the LG12 now, over the years I’ve done Buck, Black, the Tongue Range, Five Mile, Erebus…I live quite close to LG so I love the quick drive and rewarding shorter hikes. I’d love to do more in NH but the 3.5+ drive means it requires more planning. 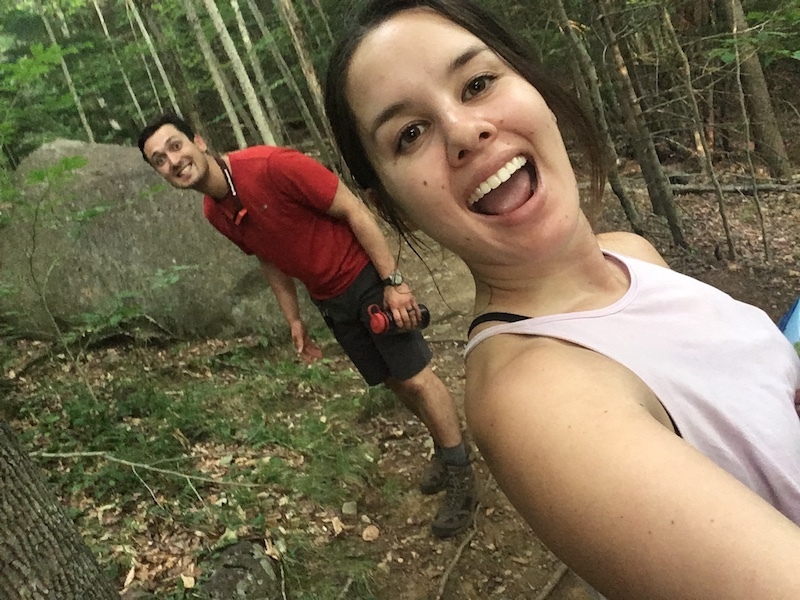 I’ve done the Presi Traverse twice now and would love to do Franconia Ridge again and there are so many other amazing hikes to check out though! I was intrigued by the LP9er Ultra, but the driving part seems kind of annoying. 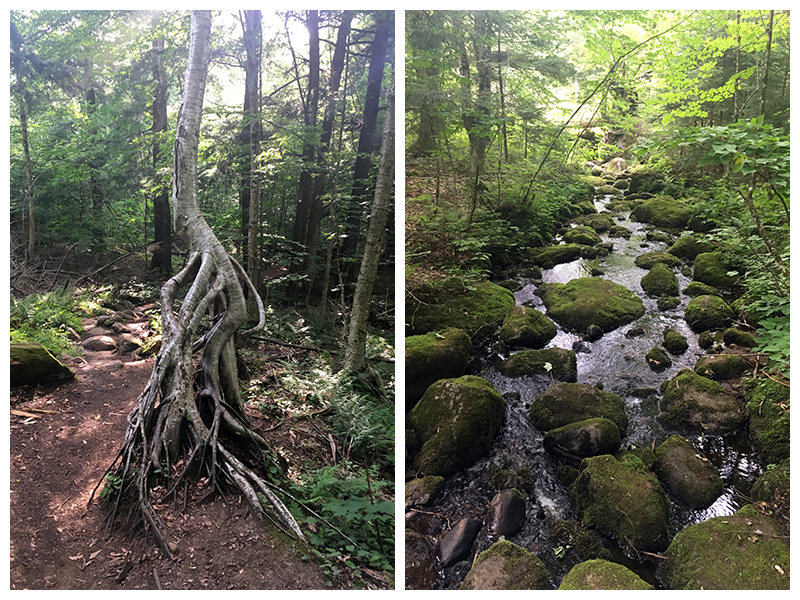 And I have been saying for YEARS I need to go do some hikes in the Catskills (especially since I live closer now). So many hikes, so little time! I love the “official challenges” but I haven’t been able to commit to one officially yet haha! I think for now I’m enjoying hiking for the views and the personal challenges. Will you move on to the NE 115 next? McKenzie was great! Yes, did Haystack to, under a hour RT from the 4 corners the back way, thanks again for sharing! 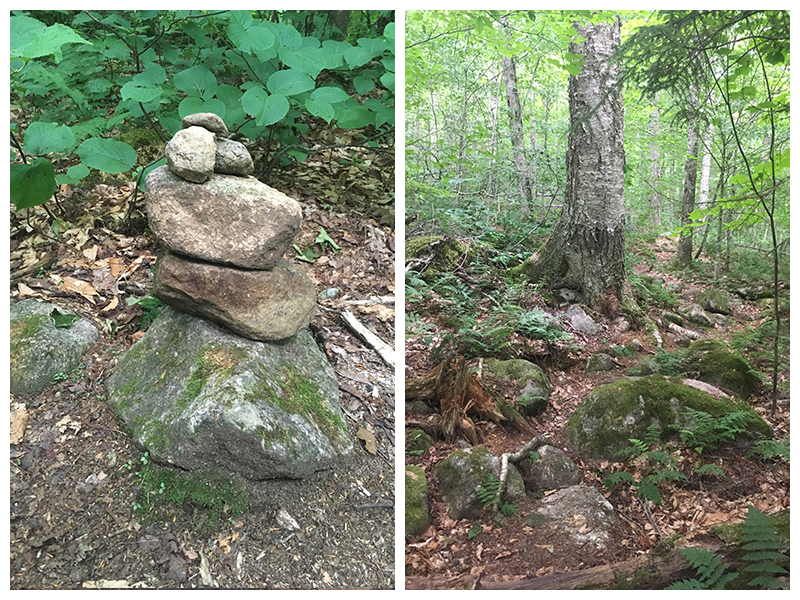 Ran into 3 20-something girls after McK about to do Haystack 2.5 miles each way, and they took my (your) advice and also did Haystack from the herd path, under a mile total such an advantage. Made their day! 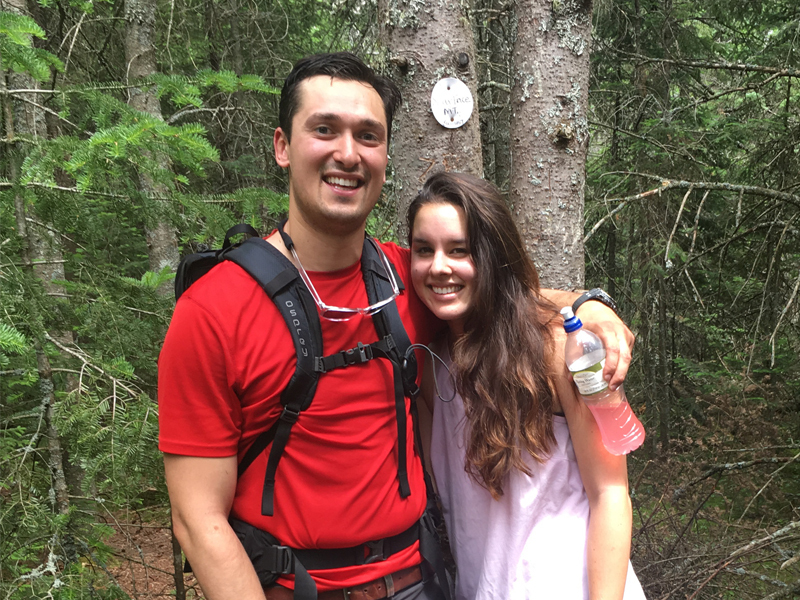 Just finished the S6 and working the ADK and Cats firetower challenge now. Wow the 7 miles hikes are nice! LG is a great place for winter hikes/snowshoe/ski with Gore so close for alpine too. Will attempt some of the LG12 on snowshoes. Non-agressively doing the 115 (meaning the NH 48 can take 10 years, not 25 months, like ADK 46.) Too far to drive from the SW corner of the ADK park about six hours each way. Catskills are easy, no mud! 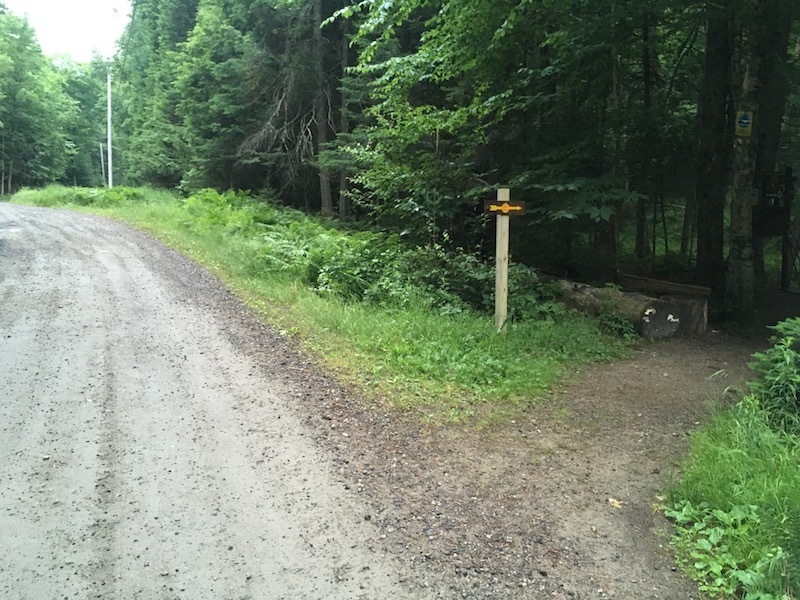 Vermont is easy, no mud. NH is, well, similar in effort to ADJ but no mud, did the Presi traverse over three nights in huts (no Adams due to weather). Still love the ADKs the most. Can’t believe you did that traverse in one day – crazy. Enough the journey, keep up the blog. You have been referenced in other forums as one of the “goto” blogs and I agree, so valuable during the 46 last few summers. Thanks again! Yup, I think we’re on the same timeline for the NH 4000 footers! 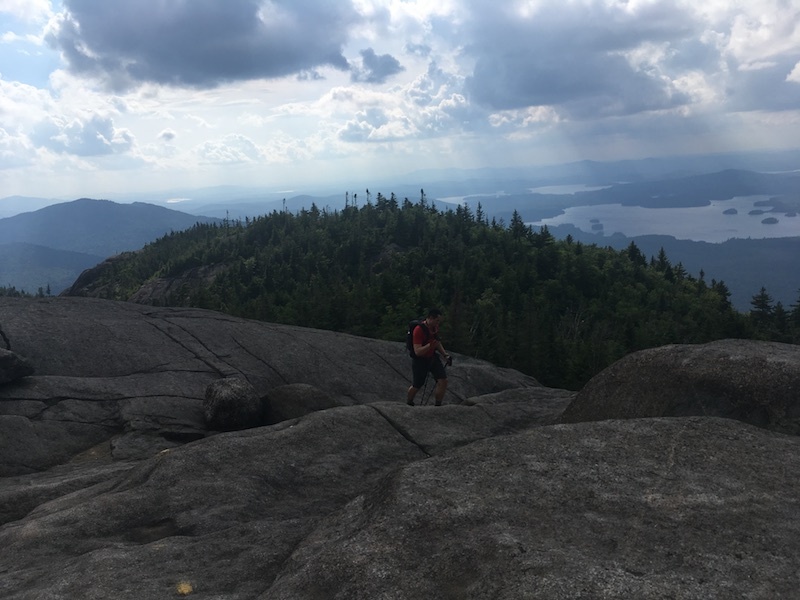 We finished the ADK 46 in about 16 months – which was great at the time, we could just follow a list and get out hiking most weekends in summer and fall – but now I’m happy to just find random hikes, new trails and revisit the favourites. 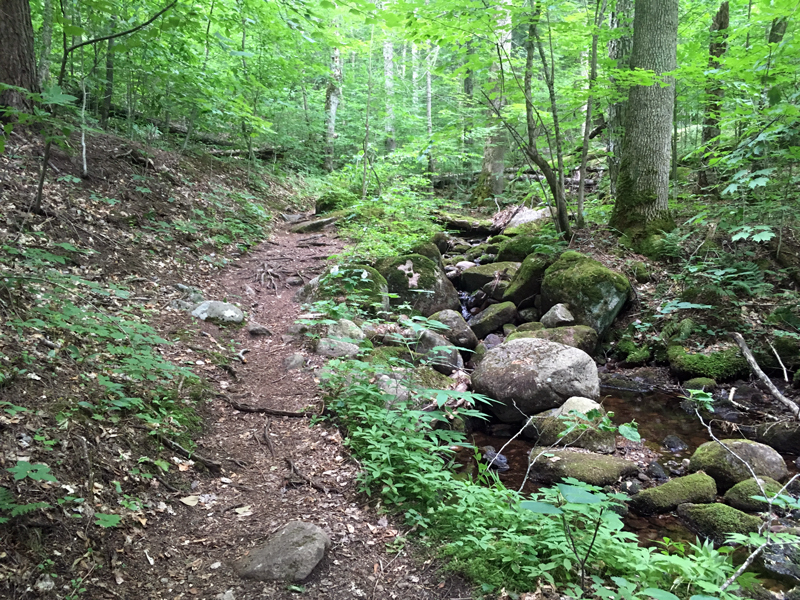 I actually just did Bennies Brook Slide to LWJ this past weekend and it was a beautiful walk (will have to write a post for that at some point) – might start doing the ADK slides. 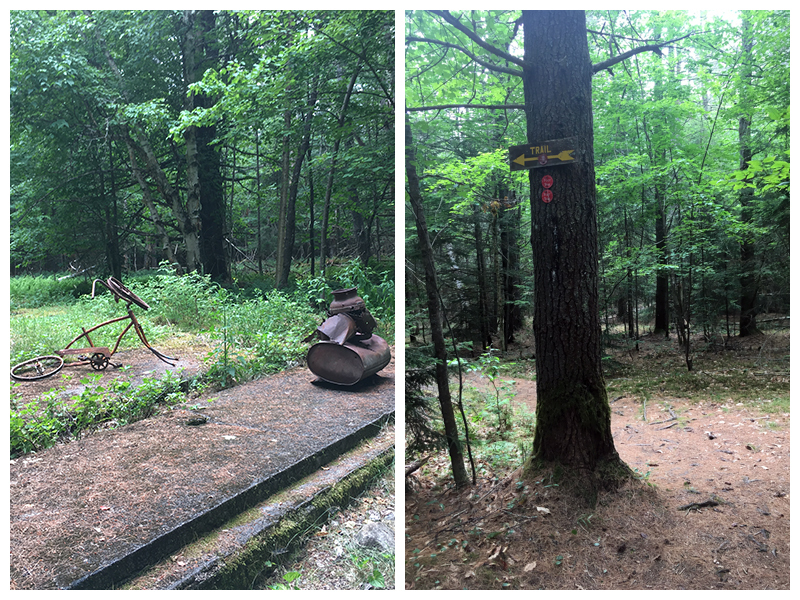 I actually just did a section of the Long Trail two weeks ago (and I think it gave me the backpacking bug – I’m now planning an end-to-end in a couple years) but there was quite a bit of mud though! 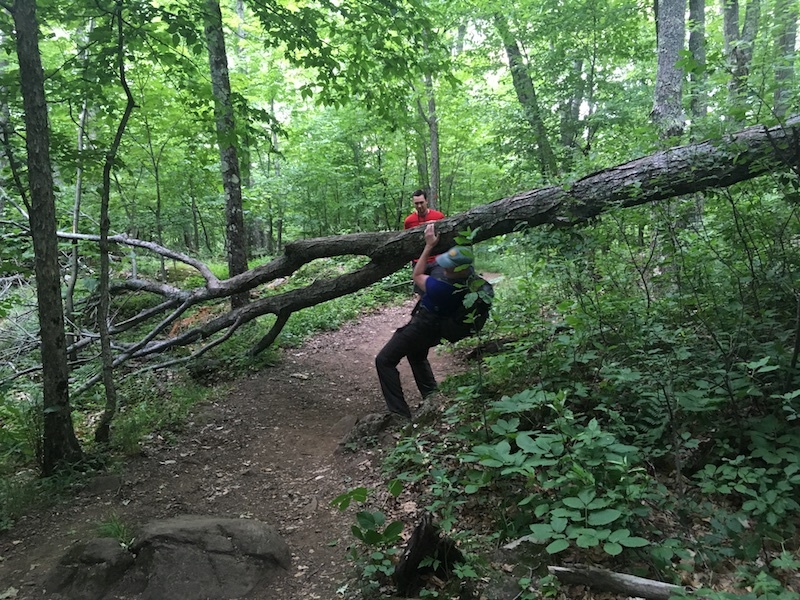 The AT thru hikers were calling it “Vermud.” You must have gotten lucky when you went! 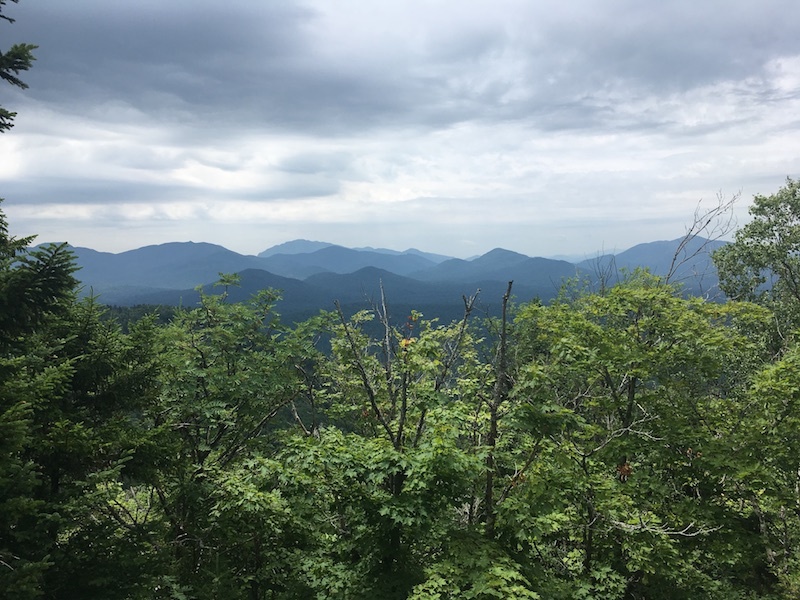 Maybe I should try to do the firetowers this winter, the shorter hikes and lower elevation will be good for me since I get so cold – you’ve just inspired me!